Shadow culture, media and sport secretary Tom Watson MP has called on fast food company McDonald's to cancel a Monopoly game which encourages people to buy and eat more fast food in order to win prizes. Read Sustain's response. 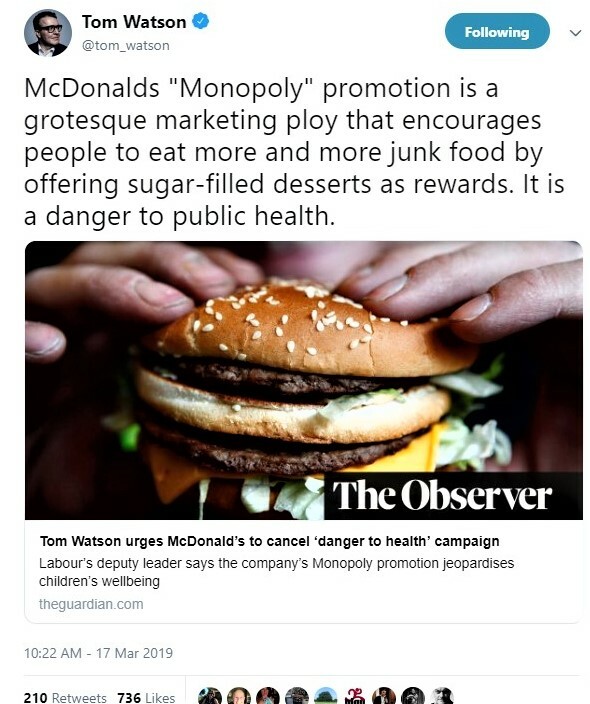 "Monopoly is an incredibly popular family game with children and adults alike, and McDonald's is playing on this to win a monopoly over our diets too. We acknowledge they have made some progress in reducing salt, fat and sugar from some items on their menu, and that larger portions don't offer more entries to the game any more. However, the game hasn't changed; the fact remains that the more food and drink you order, the more opportunities you get to win prizes, and most of the prizes are simply more food and drink at McDonald's. Meanwhile, to unlock the bigger prizes you need to collect a winning set of stickers, involving more repeat visits. Either way, it's encouraging people to visit more and order more than we might not otherwise choose to do. It's not responsible marketing. "We have a serious problem of childhood obesity in this country, and as well as government measures, such as the 9pm watershed on advertising of high fat, sugar and salt products announced today, we need companies to work harder to support healthy eating. If this game could only be played by ordering or winning the healthier items on the menu, that might be an interesting experiment. Otherwise, we agree with Tom, and this game of McNopoly needs to end for the sake of both children's and adult health." Sustain: Sustain: The alliance for better food and farming advocates food and agriculture policies and practices that enhance the health and welfare of people and animals, improve the working and living environment, enrich society and culture and promote equity. Minister fails to reassure farmers about chlorine washed chicken. Again.